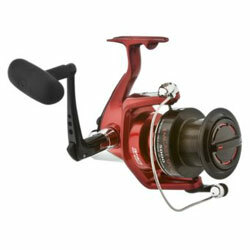 Daiwa's Emcast Sport Spinning Reel is a smooth, balanced fishing machine with cannon-like castability. The Emcast Sport comes raring to go with a super-smooth 8-bearing system (7 ball bearings and 1 roller bearing) and a large-diameter ABS aluminum spool that drastically reduces casting friction and makes for silky, consistent drag function. Each reel also sports Gyro Spin balancing, along with a Twist Buster line roller that reduces line twist. The Infinite Anti-Reverse virtually eliminates back play and ensures solid hooksets. Each reel also features a one-touch folding handle and comes with a FREE spare aluminum spool. "I got one half a year ago. First when I got it it looked little bit HUGE. Science then I pulled all kind of fish with this reel. Happy with it. Good product for the money. Just got another one." "best price ever,very good for salt water fishing from land,high performance with big fish." "I bought this reel to put with a 7ft ugly stick med/hev rod for lg catfish in KY. Took it to Myrtle Beach and caught a 5ft shovelnose shark at night. Not a problem, took 15 min and he was on shore with everybody watching. 15 lb test no leader. Good times. Great reel!"